Istanbul (Greek: Konstantinoupolis, historically Byzantium and later Constantinople) is Turkey's most populous city, and its cultural and financial center. The city covers 25 districts of the Istanbul province. It is located at 41° N 29° E, on the Bosphorus strait, and encompasses the natural harbor known as the Golden Horn, in the northwest of the country. It extends both on the European (Thrace) and on the Asian (Anatolia) side of the Bosphorus, and is thereby the only metropolis in the world which is situated on two continents. In its long history, Istanbul (Constantinople) served as the capital city of the Roman Empire (330-395), the Byzantine Empire (395-1204 and 1261-1453), the Latin Empire (1204-1261), and the Ottoman Empire (1453-1922). The city was chosen as joint European Capital of Culture for 2010. The "Historic Areas of Istanbul" were added to the UNESCO World Heritage List in 1985. Ambassador hotel comprising from the 19th century townhouses, is a First Class Boutique Hotel in Istanbul / Turkey. It has a quiet location in the old city center Sultanahmet where you can find the heart of Istanbuls History - former Constantinople. 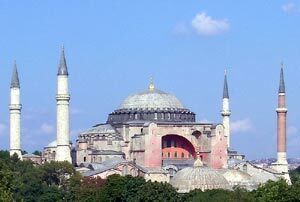 When you come out of the hotel you will feel the culture of Byzantine Empire. The hotel is within walking distance to Byzantine and Ottoman Monuments, such as St. Sophia, Blue Mosque, Basilica Cistern, Topkapi Palace and Grand Bazaar. Also other Istanbul attractions as the Cembelitas Hamami (Turkish Bath) and the Spice Market - are only a few minutes walk. On istanbulcityhotels.com is presented information over Istanbul city, sightseeing tours to Blue Mosque, St. Sophia, Topkapi Palace, Taksim and all Istanbul hotels offering online reservation with cheap prices by Olbitour - Olbia Tourism & Travel Agency. Tashkonak Istanbul hotel just a short walk to the Byzantine and Ottoman Monuments such as famous Blue Mosque, St. Sophia, Hippodrome, Grand Bazaar, Topkapi Palace and Basilica Cistern. Tashkonak is an Old Ottoman House dating back to the 19th century and has been carefully restored and refurbished to be used as a special class Hotel in Istanbul. This historic townhouse hotel property a member of boutique hotels in Istanbul Turkey.